We procure electrical grade insulating paper from Tomogawa Zapan, Monkgsco Swiss and Amodfors swedan in 1.5 to 3.00 mill thickness having better tensile strength. We have the best slitting machine to burr free slighting of the rolls in to tapes for covering. 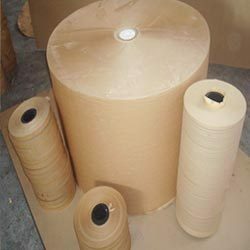 The slitted insulating kraft paper are widely used as insulation material for covering of wire and strips of both aluminium and copper for making HT & LT coils by the transformer manufacturer industries. Looking for Slitted Insulating Kraft Paper ?